Well hope things don´t get too confusing here with Torjus and me both posting. 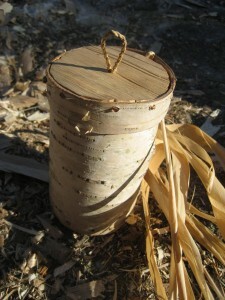 One of the smaller craft projects I´ve been working on while being in the woods lately is a fat container. I´ve mostly used canning jars for rendered fat, mainly because they work and are easily available. Fat gets rancid through exposure to sunlight, heat and/or oxygen, so a tight fitting container is preferred for that purpose. 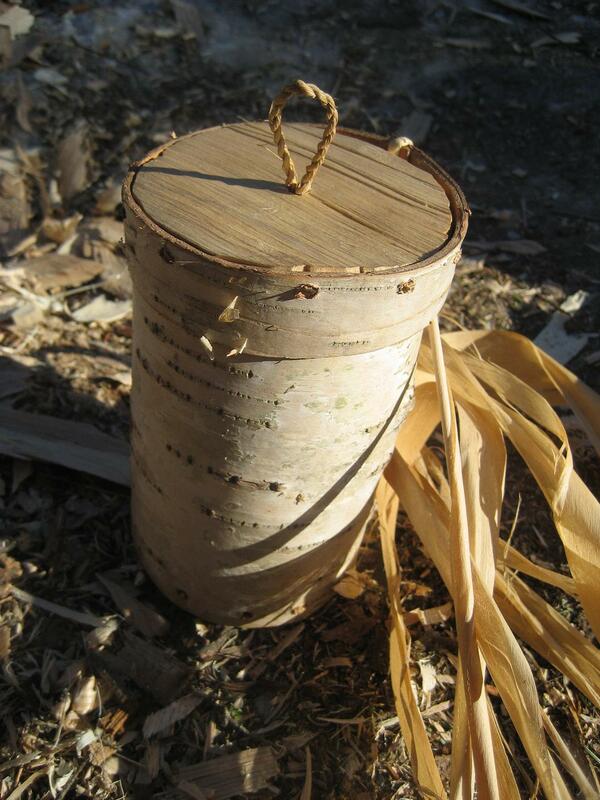 The one shown here is a design made of birch bark. 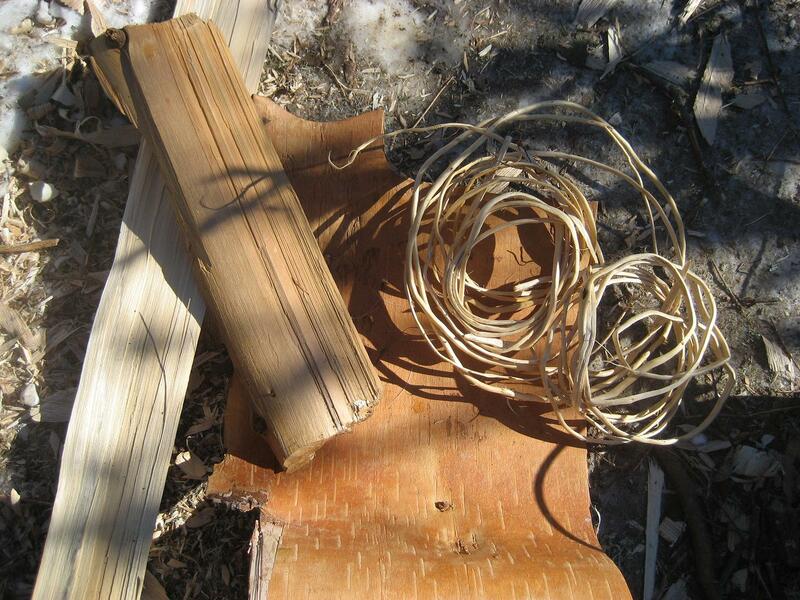 Materials used from left to right: Split cedar pieces (for lid and bottom), birch bark and spruce/balsam fir root. I may also experiment with rawhide containers for fat storage in the near future and post about it here. Thank you Kevin for your lovely donation! Inspired by Owen’s post on the ice man sheath I decided to make one for myself. I did this a while ago, but I forgot to post it on the blog. The technique is a type of knotless netting, not totally dissimilar from what Kevin is showing on his blog. I used elm bark exclusively and it is worth mentioning that it works like a charm. The knife needs to be rehafted so I’ll have to post a picture of them both at a later time. As you can see on the photo, the lower binding has slipped off, but hasn’t lost any of it’s usefulness. I’ll probably tie it back on though, as an extra security measure. Got this idea when looking at a small piece of discarded willow cordage today. I twined it back up on itself being in a playful mood and thought it would look good as a bracelet. I did however not want an ugly knot on it. After a while I found a piece of bird bone stored in a box. So, I grooved it and broke it off, scored decoration and filled the fissures with charcoal and smeared over some butter to keep it in place. Now the ends are tucked into this pipe instead. When I was a kid we used blowguns made from Wild Angelica (Angelica Sylvestris), they were only used for a day or two, then discarded. This was for playing war only, we used berries as ammo. It never occurred to me that I could use it as a hunting weapon. Since it’s very short it isn’t accurate nor powerful, Accuracy suffers badly on distances over 3-4 metres and it could only kill the smallest of birds and maybe mice. But for a first try, it’s fair enough. A wound can remain unpatched and heal up nicely, but if you don’t want to lose more blood than necessary you should put something on it. Some patching material has antibacterial qualities and heal things up quicker too. Two of the common materials that are said to have this effect is common plantain (Plantago major) and razor strop fungus (Piptoporus betulinus). 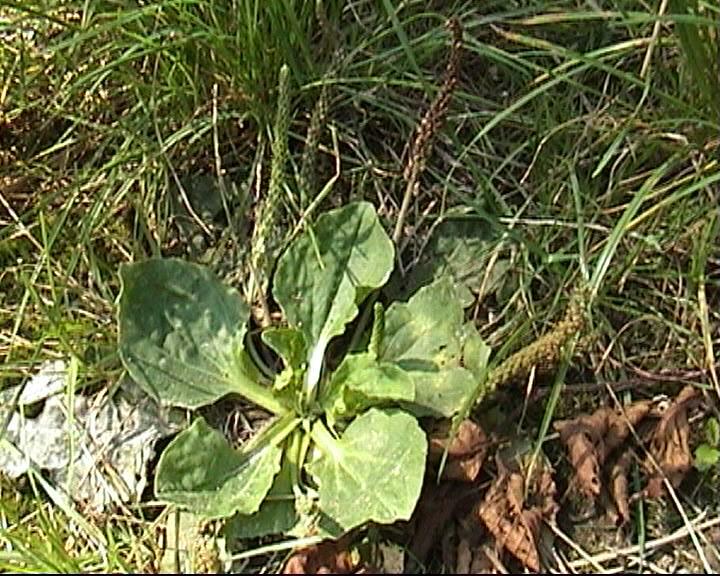 Common plantain is very frequently found on roads or well used paths. The leaves are thin and have small threads in them. Don’t wash it, but place it directly on the wound. The leaves don’t soak up blood, so you need a piece of buckskin or similar with binding around to hold it in place. Sorry about the lack of photos on this one. Thanks for the photo Kevin. Razorstrap fungus is a hoof fungus that grows most commonly on birch. To process it, take a fresh piece (they dry slowly, so you can keep one with you at all time) and make cuts around the piece you need. What you are to be cutting out is the underside, also called the pores. Stick a knife underneath and skin the flake off. As Kevin shows in his blog you can use it as a self adhesive plaster. If the adhesion isn’t strong enough, just use a binding around it. While on the trip I used it on a infected wound, it seemed to work, but it burned like hell! I advise that you use the inside of the strap, since it is likely to be most sterile.